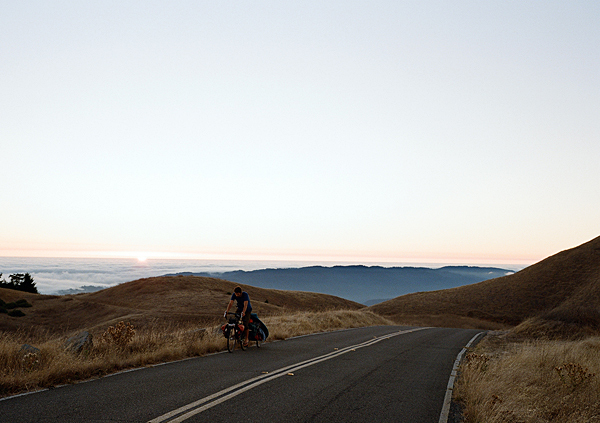 In September 2012, Dan Malloy, Kanoa Zimmerman and Kellen Keene rode bikes down the California coast hoping to see their home state in a new slower-paced light -- surfing, camping, staying with friends and lending a hand wherever they could to earn their keep. The result of the trip is a beautifully crafted book and DVD. Tell us about Slow is Fast. What was the seed or genesis of this project? It was a culmination of a ton of different things over the last 15 years of travelling non-stop. I came to the realization that even though I love being on the road and getting good surf, I became getting fascinated with the idea of starting to learn more about where I’m from. I wanted to see California in the way that I do when I travel. When I am on the road, I feel really open and clear to what’s going on around me and it’s a lot easier to notice what is happening. When I’m home, the day-to-day starts to catch up with me and I feel like I stop noticing how pretty it is right where I am. So I began to think of ways to access the frame of mind of being on the road – while I am at home. How did the bike ride and planning all come together? What sparked the trip was when me and a friend of mine took a trip to Oregon a couple years back. I told him about the idea and explained I had been on a short bike ride trip once before that was about 5 days long and I remember it being a really good time. I was able to be in the water and be on the road a lot. It was a pretty healthy and fun way to travel. My friend Kellen was psyched on the idea and he really held me to it. And before I knew it he said, “I have this month open when I get back from a fishing trip in Alaska, does that work for you?” He kept pushing me to do it and so I am guessing it was on. We decided that besides riding the bikes we wanted to try to document the trip in a different way than we had previously. I then talked to Kanoa Zimmerman. He is a great photographer originally from Kauai, but now lives in San Francisco. He takes an opposite approach of some other photographers that I am used to working with. He is super patient and takes just a few pictures every day. So with Kellen, Kanoa, and myself, we had the basis for our crew and we all planned the trip together. The goal was to stop at really interesting places down the coast. People that we wanted to visit for a long time and we wanted to definitely stop at farms. All with the goal in mind that we wanted to stop and learn from people along the way. The trip was based loosely on a program called “wwoof-ing.” It is an acronym for Willing Workers on Organic Farms. You can travel around, work at farms and then you get to stay there with room and board. We didn’t stay at the Woof-designated farms, but instead with people that we knew. Kanoa planned most of the trip and was in charge of taking the photographs. Kellen was in charge of doing the cinematography. I was helping out with both of those things as well as doing the interviews. Where did your interest in organic farming come from? I started to pay closer attention to where my food was coming from. I made it a point to buy foods that was as fresh as they possibly could be. That led me to the path of reading works by Wendell Berry and Gary Snyder. It led me to start to meet the people who were actually growing my food. It’s been real enlightening and a fun thing to make that connection. Then about six years ago, I met my wife who worked on an organic farm. It became more of a priority for me to learn about farming and be involved in it in some way. I am beginning to understand how big of a role it plays in communities and the connections it makes with people. It’s very accessible and unlike politics which can sometimes feel negative, with farming you can do a lot of good on every level and be really engaged in your community. What is your relationship with Patagonia? My brothers and I were from Ventura and we were smitten by the surf industry when we were kids. Being sponsored, we had a great time and we traveled like crazy. After about 10 or 15 years we started to get a little disillusioned about exactly what we were up to. As we were growing out of the demographic we were once a part of, we began to realize that were actually glorified t-shirt salesmen. We became confused about what we were up to and why we were doing it. Then about 10 years ago, Patagonia came to us because they wanted to put more time and energy into their surf and ocean division. Patagonia was from Ventura and that’s where we’re from, too. We respected what they made and what they do. When they approached us it was a really exciting time for us and it has worked out great. As Ambassadors for the brand, we surf, spend a ton of time working with the crew, and help with marketing events. Basically we take the message from Yvon Chouinard and the company and translate that to surfing. Rell Sunn worked for them back in the day and she was one of my heroes. And to get to work with Gerry Lopez and Wayne Lynch has been a total blast. What are you hoping that Slow is Fast accomplishes? When we first started we wanted to just make a ‘zine. We planned on making around 300 of them for as little money as we could. The trip was such an amazing journey, and so many people took us in and took great care of us that we wanted to give 100 of them to gift as a thank you. One day my brother came in and said, “Dude, if you are going to put this much time and energy to it, why not make a thousand. Make it a perfect bound book or something.” It went from being a fun little artifact from our trip into something more. I guess the takeaway is that traveling is cool, but there is a ton of beauty right where you are – all around you. And there is a ton of amazing people to learn from, too. It doesn’t mean you have to fly to get there. It could be as something as simple as taking a bike. Find out more about Slow is Fast here.